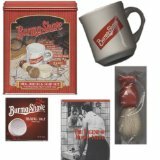 Burma-Shave Mug Brush And Soap Set. This set is for someone who enjoys doing things the old-fashioned way. The only way to shave that is older would be with a straight edge. This set is all you need to shave with to get a very close and comfortable shave. Set includes a Burma-Shave mug, cake of mildly scented shaving soap, and a brush with natural bristles. The mug is an old time classic. Old-timers will remember driving down the road and reading the signs, one after another. You read one, and then waited, read another, and waited, until you finally came to the last one that said "Burma-Shave". Too bad they don't have those signs today, our kids would get a kick out of them. This would also make an inexpensive gift for a birthday, or at Christmas. Introduce somebody else to the pleasures of shaving the old-fashioned way. They will appreciate the new-old way of shaving.